Seven people A, B, C, D, E, F and G were appointed to a company on seven different days of the same week starting from Monday to Sunday(but not necessarily in the same order). 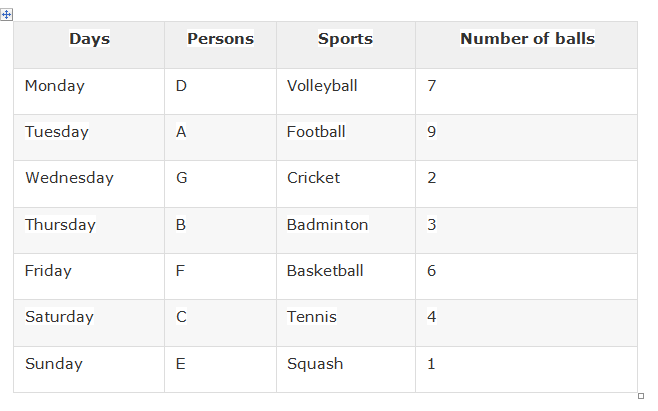 Each person also plays a different game namely – Cricket, Basketball, Football, Squash, Volleyball, Tennis and Badminton. (but not necessarily in the same order). Each person has a different number of balls starting from 1 to 9. Only two people were appointed after the one who plays Basketball. E was appointed on one of the days after the one who plays Basketball. Only three people were appointed between E and G. Only one person was appointed between G and the one who plays Volleyball. A was appointed immediately after the one who plays volleyball. only three people were appointed after the one who plays Badminton. C was appointed immediately after F but not on Friday. Only one people was appointed between F and the one who plays cricket. B was appointed immediately after the one who plays cricket. More than two people were appointed between D and the one who plays tennis. E does not play Football and Tennis. There are four persons play between the person who has the maximum number of balls and the person who has the minimum number of balls. Person D hold more balls than the Person F. The number of balls hold by Person C is the Square of the number of balls hold by G. Total number of balls hold by G is less than 3. The total number of balls hold by B is less than 4. The persons who play on Sunday and Monday don’t have the maximum number of balls while the persons who play on Saturday and Tuesday don’t have the minimum number of balls. The difference between the total number of balls hold by the person D and F is one. The number of balls hold by Person A is the square of the number of balls hold by B. Total number of balls hold by the person who plays Basketball is the multiple of the number of balls hold by G and B. Who amongst the following was appointed on Thursday? Which of the following statements is true as per the given arrangement? The person who plays Volleyball was appointed on which of the following days? Which of the following combinations will be definitely true as per the given arrangement? How many balls are used by B? Which of the following expressions is true if the expression P<T<=O>S>M>=N is definitely true? Directions(Q.9-10) In each of the following questions, two rows of numbers are given. The resultant number in each row is to be worked out separately based on the following rules and the questions below the rows of numbers are to be answered. The operations of numbers progress from the left to the right. (i) If an odd number is followed by another composite odd number, they are to be added. If ‘A’ is the resultant of the first row, what will be the resultant of the second row? If ‘Z’ is the resultant of the first row, what will be the resultant of the second row ?